Back side of the plant. 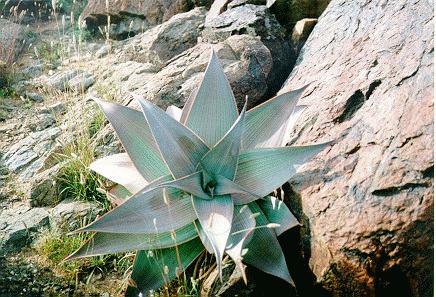 Aloe karasbergensis (Pillans) is a aloe which is related to A.striata and A.buhrii, the leaves are soft and more curved and striated. 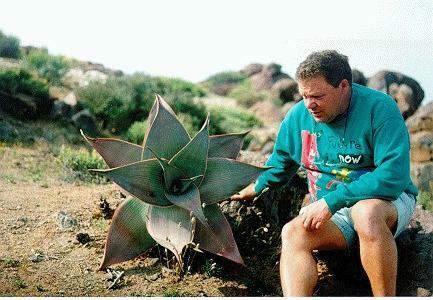 The plant is about 1 metre as you can see. This photo was taken on October 8,1996, south of the richtersveld. It flowers from January to March and the flowers vary from pinkish-red to orange and the leaves are bright blue/green and soft. 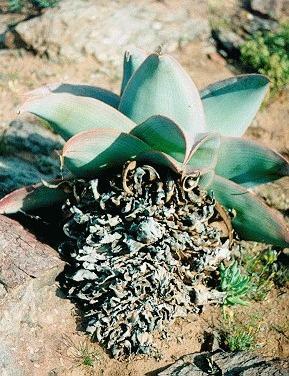 This species is distributed from the Nothern Cape to South-Namibia and grows in the most arid regions of South Africa, but in cultivation it tolerate more water. On sand flats it forms clusters but mostly it grows solitary.